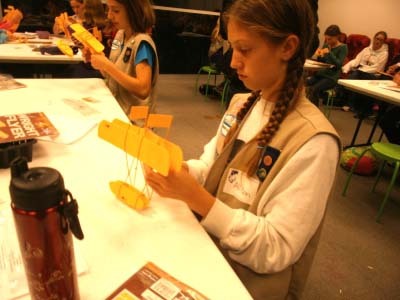 Tours, Programs and Workshops for Girl Scouts of All Ages! 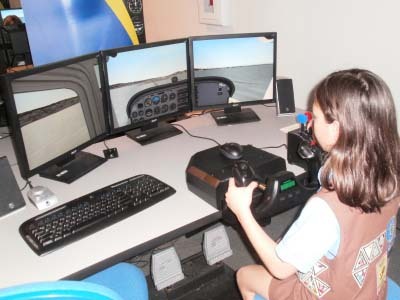 Special programs just for Girl Scout Daisies through Juniors provide unique opportunities to get close to aviation while pursuing an age-appropriate Journey. All Scouts receive a special Hiller Aviation Museum patch as part of their program. Patches issued by Hiller Aviation Museum are wearable on the reverse side of Scouts’ vest or sash. Additional dates are available to Troops of 12 or more. Contact the Hiller Aviation Museum’s Education Department at (650) 654-0200 to find out more about Troop-specific programs. Launch an adventure in flight and discover aviation and technology in a fun-filled way. Get up close to a real airplane, touch its parts and climb inside to test the controls. 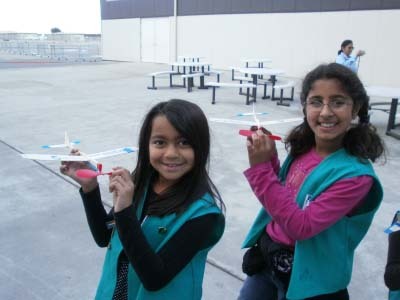 Make and fly a working glider and explore a collection of historic aircraft flown by inspiring women in aviation. Includes a “Sky Daisies” fun patch. Suitable as a side trip for the Between Earth and Sky Journey or Tula petal. Additional dates in 2020: January 25, March 28, April 25, May 18. Explore the world of flight! Help assemble a full-sized airplane and fly a working model aircraft. 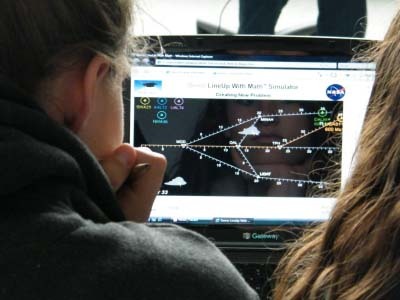 Complete a scavenger hunt discovering the roles of fabulous female aviators, take a virtual flight using the Sky Portal mapping exhibit and more in a hands-on aviation experience. Includes “Brownie Flyers” fun patch. Completes Step 1 of the Senses Badge and Step 3 of the Computer Expert Badge. Additional dates in 2020: January 11, March 21, April 18, May 11. Take the controls in a high-flying adventure! Master pilot skills in a realistic flight simulation. Build and fly a model airplane, experiment with Morse code, explore a giant Grumman Albatross seaplane used to commemorate Amelia Earhart’s mysterious flight and more in an aerial adventure! Includes “Junior Pilots” fun patch. Completes Step 2 of the Detective Badge. Online enrollment is encouraged for Daisies, Brownies and Juniors to facilitate immediate processing. Space is limited and programs may fill up. Telephone registration is available at (650) 654-0200. Paper registration forms may be submitted with payment to the Hiller Aviation Museum, 601 Skyway Rd., San Carlos, CA 94070. Registrations may also be faxed to (650) 654-0220. The program fee for each Scout is charged at the time of registration. Additional Scouts may be added on a space-available at a later date and will be grouped together with their Troop so long as the Troop number is provided on the registration form. Cancellations must be requested seven days in advance and will have a processing fee of $5/Scout deducted from the refund. Adults and siblings will be admitted at the discounted rate of $9/person. Adult/sibling admission is not charged together with Scout registration, but must be paid in person on the day of the program. 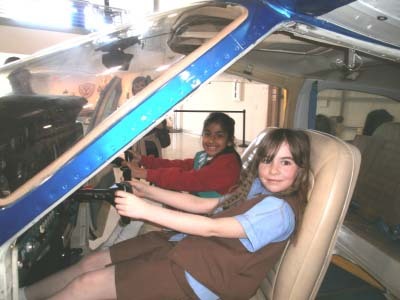 All Scouts will participate in a Women in Aviation tour. The Hiller Aviation Museum displays several aircraft flown by noted female aviators, and its Women in Aviation exhibition highlights twenty different female flyers past and present from around the world. Scouts are encouraged to explore the Gallery to learn more about these pioneering aviatrices and their aircraft by completing an Exhibit Safari, with answers found within the Gallery. Troops returning a completed safari to the Docent Station (adjacent to the Gift Shop and bathrooms) will receive a special prize for each Scout in attendance.